Pecan Pie was always one of my favorites in pre-vegan days. So I'm not sure why it's taken me so long to create my own version! I think because I wanted to make a soy-free version. I mean, I enjoy using silken tofu in many creamy recipes, but for pecan pie I knew I needed a filling that was a touch more rich and luscious. So, now I have a soy-free version... and it IS rich and luscious. I've tested it a couple of times now. The first time I made it more traditionally mixing the pecans in the custardy filling. But you know what? When I bite into that pie, I want the custardy filling to stand apart from the pecans, at least in part. I prefer the pecans with some crunch, rather than plumping and getting softer absorbing some of the filling through baking. So, I make this my signature pecan pie, allowing some pecans to get a touch soft while adding a crunchy sugar-pecan topping. Hubby's birthday is coming up so I think I'll make this again for our family get-together. I know he wants chocolate cake, so yeah, he'll get that. Guess we'll all be having our cake and eating it (and pie) too! Looks great Dreena! Lucky hubby! Wow, it looks delicious! I've never tried pecan pie..it seems like I am surely missing out! Oh baby! That looks so worth the calories. I have to say off topic, Dreena. I've tried so many hummus recipes. And I keep going back to your Creamy Hummus. It's simply the best. Wow! That does look really rich - and sweet. Yum! Yummy- your pecan pie looks so much creamier and silkier than the tradition version! Wow! That looks absolutely perfect. My mom is a huge pecan pie fan, I'll have to make this for her someday! PS Happy b-day to your hubby! That pie looks lovely Dreena - makes my mouth water just looking at it!! Is this a receipe for a new book by any chance?? I love pecan pie!!! I can't wait to see the recipe. this is excellent...i am definitely going to try this recipe on my father, who grew up on midwestern/southern "comfort food", and resists the idea that vegan recipes can really embody what he's used to. i think this'll prove him wrong once and for all !! Lenora and jd... sorry, I know it must be irksome at times to see me post a new recipe - without the recipe! I tend to work on new stuff and post about them with photos before I've even polished off the recipe. Plus, I soon have to determine what I'm going to do with my new recipes. I want to show you new and fun things, since many of you have ed&bv/vive/TEV, but I'm not always able to post the recipes right away. I will try to get some new ones posted soon (like the fit-tucine alfredo). Thanks for being patient!! Oooooh, pecan pie is definitely my favourite. I can't wait to try this version. 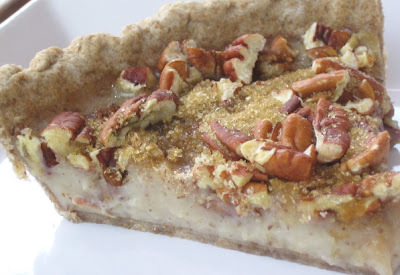 Oooh I love love love Pecan PIe too and I am so glad you have made a vegan version! That looks soooo good. I've been craving a good pecan pie.